It is Seahawks fever in this Seahawks nation as we return to the Super bowl yet again. We went out for doughnuts in the morning as a special treat and Top Pot Doughnuts had dough nuts with blue and green sprinkles on them called the GoHawks! Well, we just had to buy that! And then I had to stop over at Fred Meyer to pick up my blue and green nail paint (the one from last year had gone dry and I only checked last night) and most everyone was wearing SeaHawks something or looking through game apparel to buy for tomorrow. And when you look up, it was a sea of blue and green balloons and people were buying them by the dozen! I just love this city, all decked up in blue and green, for its people and the passion they have. Here is one more recipe, incase you are still looking for something to make for the superbowl tomorrow! Heat the oil in a sauce pan, add the wings to it and add all the sauces and vinegar, sugar, salt and pepper. Mix it well together. After 2-3 minutes turn the wings over to the other side and let cook for 2-3 minutes more. Meanwhile preheat the oven to 350F. Transfer the wings along with the sauce to an oven proof shallow dish and bake in the oven for 20-25 minutes or until the wings are done. Turn them over in between. There will be leftover sauce in the dish after baking. Serve that as a dipping sauce. the oil in a sauce pan, add the wings to it and add all the sauces and vinegar, sugar, salt and pepper. Thanks for this simple to follow recipe… Look so delicious! WOW!! these look AMAZING and easy enough to make. Great photgraphy btw. Oh my gosh…my mouth is watering. 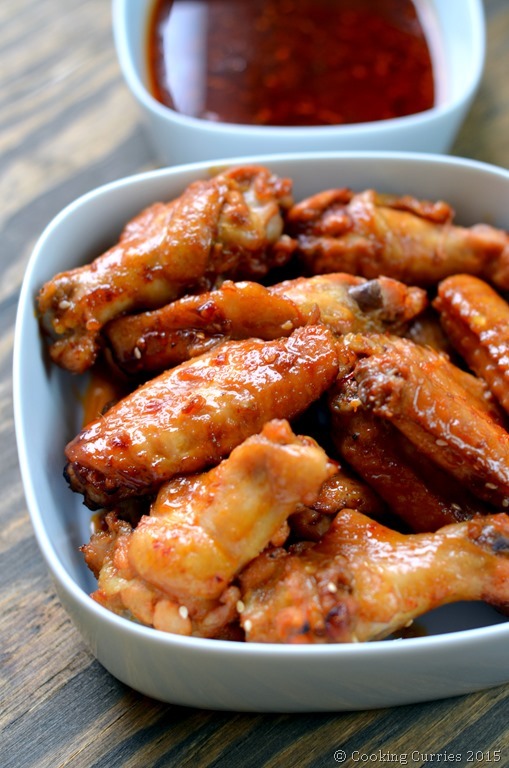 I have seriously been a wings kick lately – so I will definitely have to give this recipe a try. Thank you for sharing! 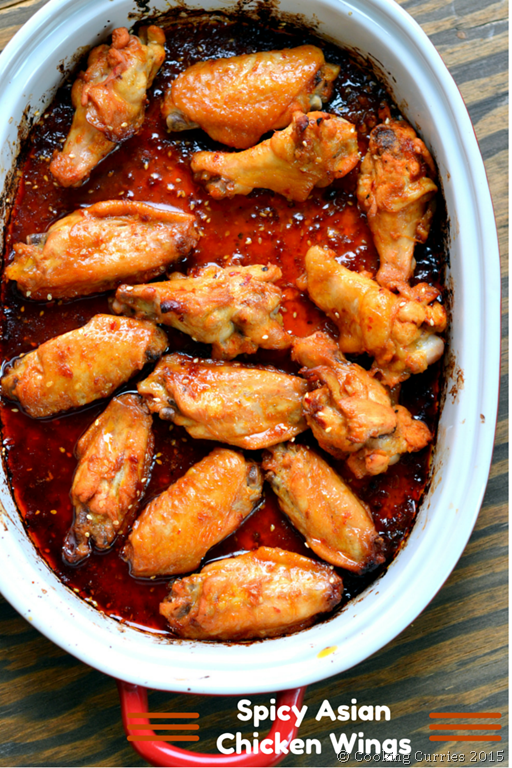 We eat a lot of chicken wings in my house and these look fabulous! I love baked wings. This sauce sounds delicious. These look fantastic I love making wings!! They are always such a huge hit in my house! Can’t wait to try this. Ohhh what a great looking chicken recipe! Thank you for sharing… I can’t to try it!! Great recipe! 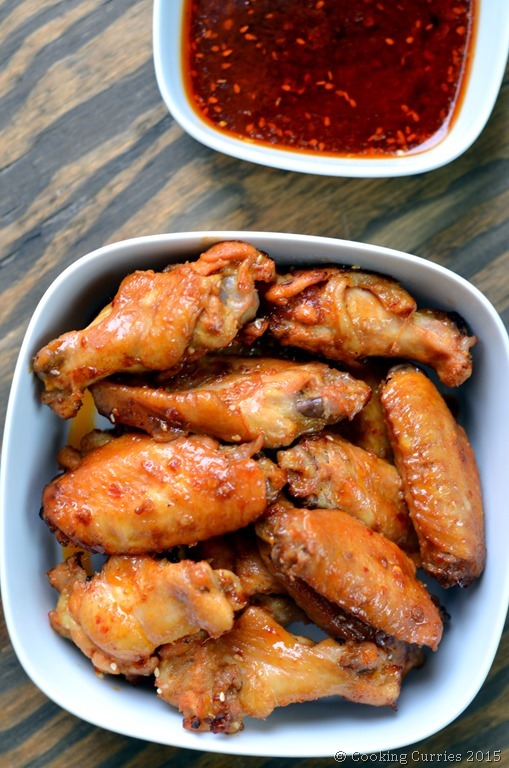 I have a Sweet and Sour Chicken wings recipe on my blog wit my secret sauce, now I’m thinking a combination of your recipe and mine would be a good one! Yes, please! These would be perfect for super bowl!